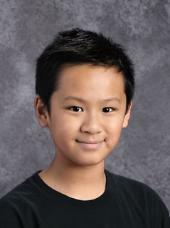 Oliver Liang, grade 6, has attended BASIS Independent for three years. Oliver enjoys (yes enjoys!) math and the challenge of solving complex problems. He volunteers to host shadow students and is genuinely excited to show students around the school. Oliver said that “Teachers here really take the time to make sure each student understands the material before moving forward.” He also noted that in addition to taking class time to assess individual student progress, teachers have office hours where students can get additional support. 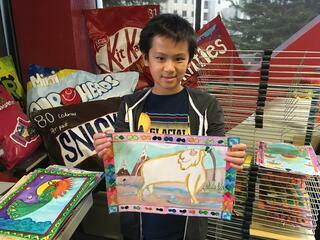 When asked about his favorite subject, Oliver lit up, and said, “I have two, math and art!” He said that his math teacher, Ms. Jain, “is very patient,” and helps him through even the most difficult concepts by explaining in a manner that is easy for him to understand. As it relates to art, Oliver said that art gives him an opportunity to express himself and do projects that are fun. He added, “It also helps that Mr. Tucker is funny,” and that he makes art accessible for everyone. For my first class, I have Pre-Algebra with Ms. Jain. It’s awesome! Ms. Jain explains things very clearly. I also like the way the class is structured. We build on skills we learned before with assessments and reviews of past content. I feel very prepared for my tests because of Ms. Jain’s patience and how often we review our material. Next is Phys-ed. Sports are fun! It’s a great way for me to get out all my energy, get moving, and have fun with my friends. I like that gym is in the morning between my classes; exercising in the morning helps me think better for my late morning classes. Biology is next with Ms. Sharma. It’s difficult but I actually like taking detailed notes. It helps me remember and reinforce what I’ve learned in class. Our teacher makes her presentations very clear and easy to understand. I also think that I’m very prepared for tests. Our teacher prepares a study-guide for every test and we go over it to make sure everyone understands the concepts. Biology is fascinating. It’s fun to learn how biological systems work. At lunch I like to play, hang out with friends in the cafeteria, we go out sometimes, and watch students playing volleyball or play games. It’s a great time for us to relax in the middle of the day. I have Art History and Practice after lunch with Mr. Tucker. Mr. Tucker is very funny and he makes arts come alive. The projects are very fun! I like how we get to try different projects and work in a variety of different mediums. One of the projects I just finished was a wax resistance art project that involved oil pastels and crayons. This class allows me to access my creative side. I have World History and Geography with Mr. Bennett next. I like that our teacher connects what happened in the past to our present. It’s a challenging class in that there are lots of things to remember but we have the support in place to help. Our teacher encourages lots of peer-to-peer teaching. Fellow students help each other and it’s also a great way to get to know my classmates. This is very helpful as it allows us to take ownership but with the support of our teacher. Next is Chemistry with Dr. Neff or Physics with Mr. Adams. What I really enjoy most about my science classes is experimentation! I love when we do labs! It’s fun to work with chemicals safely and in a lab setting. The exams are difficult but I remember so much more because we got to do a lot of hands-on lab experiments. 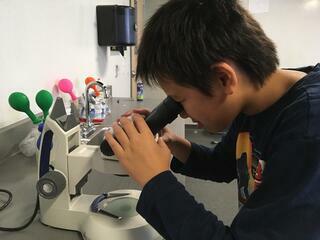 Recently, we did a food lab where we examined crystals. Our objective was to use various methods to identify the crystals. It was fun to crush them, testing them in various ways, and identify them. After Chemistry/Physics is English with Mr. Erwin. It may be strange to say this but I like diagramming sentences! I like to be challenged and diagramming is a lot like order of operation in math. I like logic based homework. I also like to write funny stories. One of the recent writing assignments was for us to pick a childhood photo and write an essay about what was happening in the photo. Overall I feel like there is a good balance between the classes that are more academic with the arts, electives, and the variety of clubs we can join after school. I also feel safe here and that the teachers and staff make sure we’re in a safe environment. I’d also like to add that I think that while the classes are challenging, the teachers find ways to make then fun and engaging.